Three legged tripod dog and cat greeting cards, note cards, trading cards, sympathy cards and blank greeting cards. 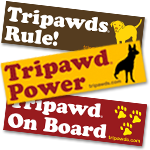 Your purchase helps support the Tripawds Community and Discussion Forums for amputee dogs and bone cancer survivors. Don't miss the seasonal selection of Tripawds Holiday Cards and Ornaments! Scroll down for larger quantities and holiday cards!